Solera at Anthem offers the peace and serenity of an adult community for active lifestyle without the high cost of Gated or guard gated communities. Located in Anthem which is actually Henderson, NV taking S Eastern Avenue past Horizon Ridge and taking the Anthem turnoff. 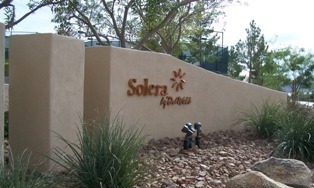 Continue past Anthem country club until you start noticing the signs for Solera. This immaculately maintained Community is located within the master planned area of Anthem in Henderson Nevada. Zip codes for Anthem are 89052 and 89044. The zip code for Solera is 89044. Click here to contact a local real estate veteran to find your specific home. I cant say enough about this area, the master planned community has landscaped lined streets, incredible upkeep, tons of area shopping with all of your favorite stores and a mall within 10 miles. Great food to eat on every corner. 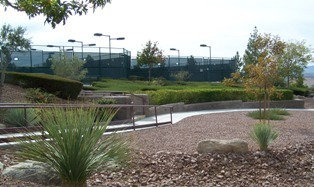 This amazing 55 and over age restricted development is about 30 minutes from the Las Vegas Strip. The homes are nestled at a higher elevation boasting many amazing valley views and gorgeous mountain views. The District Shopping and Dining fun for the whole family, bars, food, events, outdoor movies and so much more. There are a lot of nice restaurants in the area and boutiques. The area has all the Starbucks you could desire, a newly remodeled Vons, convenient to Walgreens and medical facilities including the gorgeous St Rose Hospital. There are so many amazing shopping opportunities in the area, but my favorite which is about a 20 minute drive is Town Square. You will fall in love with this place for shopping and dining and even a play place for the grandkids. In your immediate area, there is a beautiful Vons shopping center and a Walgreens as well as many great coffee places, and medical facilities, , no need will go unmet here. Return to Las Vegas Senior Living from "Solera at Anthem"